What happens when a project changes architects midway through construction? When the owners of a house under construction in Truckee, Calif., decided to abandon the mountain-style look of their partially built home, they turned to Los Angeles-based Marmol Radziner’s modern aesthetic. The about-face required builder Mark Tanner Construction to swiftly adapt in order to stay on schedule. Tasked with scrapping the partially completed second floor, Tanner’s team shifted toward a sharper style. Large glass windows were installed under a multi-tiered flat metal roofing to create an open, modern appearance. Bright walls juxtaposed against clean stone work created a sleek but comfortable atmosphere. 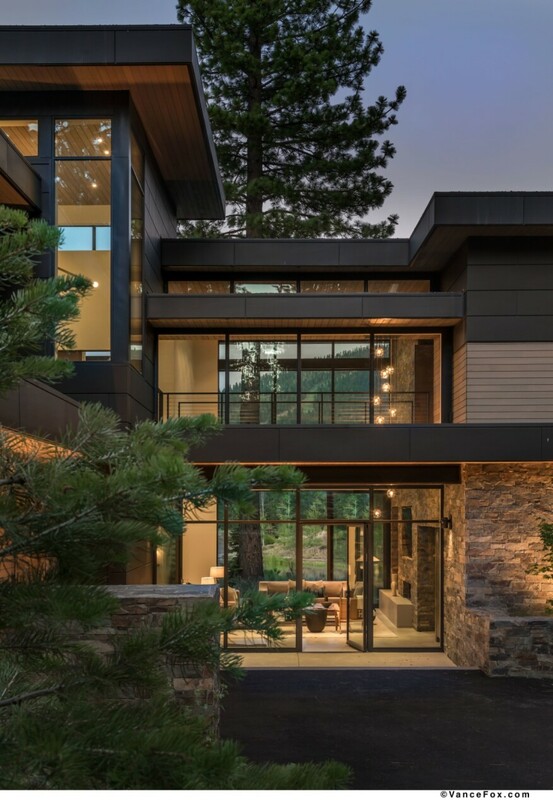 With the transition of architects, the project metamorphosed from a traditional mountain-style cabin into a striking modern retreat that establishes a connection to he surrounding landscape. Shortly after the switch in architects, a second “seismic shift” in the project’s scope in the project occurred when the owners purchased a triangular-shaped adjacent lot, and set about plans to build a guest house. The one-room outbuilding added just over 1,000 square feet of living space, complete with a kitchen, seating area, and a fold-out wall bed, and outside, a heated pool with retractable cover set into an open concrete patio. 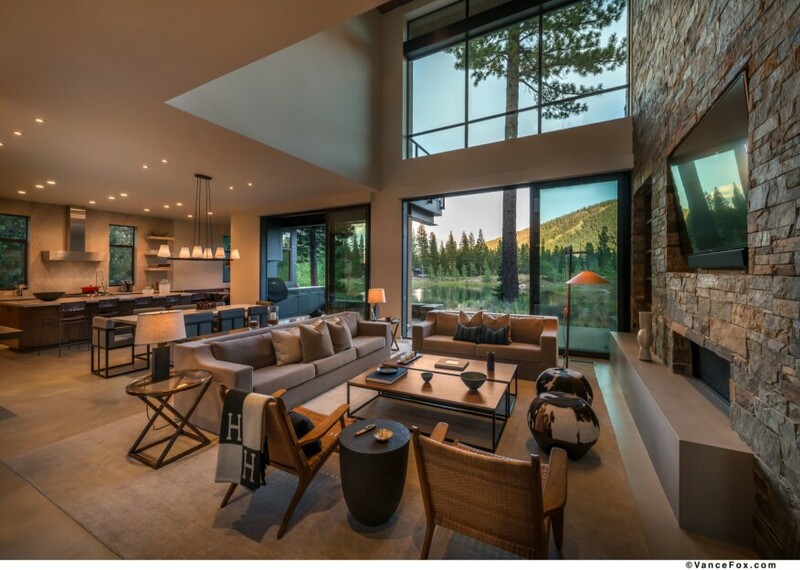 The design emphasized natural earth tones, refined materials and fluid transitions from interior to exterior spaces. The landscaping utilized native flora wherever possible, creating not only environmental sustainability, but also a seamless transition between the project’s site and the surrounding landscape. Looking back, what was the most difficult part of shifting your team’s work to adapt to the architecturally different style? The most difficult aspect of the change was transitioning from a local team to one that is 500 miles away. Thankfully, the Radziner team was always available and very professional, and the distance was overcome by maintaining open lines of communication. We used very high-end products with extended lead times that required deliberate planning, and scheduling design reviews of shop drawings that coincided with the project schedule was very important. What steps did your team and Radizner’s office take to ensure that the design and construction process would continue smoothly? We knew communication would be of paramount importance. We held weekly conference calls with the Radziner team to discuss the project in detail, and we used Basecamp and other networking software to plan ideas and details in real time. What are some of the innovations applied to this project? The sustainable landscaping was a major source of innovation in this project. We harvested many of the mature trees and native plants from within the construction site and stored them at a nursery in the Carson Valley to be replanted on the property once the project was complete. The overall architecture that Radziner’s team developed provided a very natural approach that complements the site’s surroundings. Additionally, high-end thermally insulated steel windows—custom made by Arcadia—were used on both houses. The shop drawings for these high grade windows required extensive review, in addition to 18-week lead times for manufacturing. The weight of the windows required specialty equipment and nearly double the amount of time for installation. Finally, the panel siding was made from Anthra Zinc, which is a very rare metal that required custom builds for each panel to fit in precise locations on the exterior. Shop drawing review and extended lead times for the specialty metal made the home truly one of a kind.